In the two years since Ontario indie rockers the Most Serene Republic released ...And the Ever Expanding Universe, the group have kept their fans satisfied with stop-gap releases like the Fantasick Impossibliss EP and their Roots campaign with Douglas Coupland. But the latest music to come from Most Serene Republic camp is a collection of recordings made in 2003, prior to the band's formation. Entitled Pre-Serene: Thee Oneironauts, this eight-song set is due to drop on May 24 via the group's own Home of the Rebels label. Luckily, you won't have to wait until then to hear the early material, as we have the whole thing streaming at Exclaim.ca. Go here to listen. Before forming the Most Serene Republic, Adrian Jewett, Ryan Lenssen and Nick Greaves played in a band called Thee Oneironauts with saxophonist/backup vocalist Emily Hunt. The musicians were just 18, and a press release calls their collaboration "an ode to indie rock sans any pretension beyond the basement walls." The eight songs "are born from the illusion of love and the illusion of life in general." This includes a danceable, synth-spiked tune called "Zoltar Speaks" that was inspired by the Tom Hanks movie Big. There is also the track "Home of the Rebels," which provided the name for the Most Serene Republic's self-run imprint. In these songs, you will hear "the initial spark and curiosity that would become one of the more explosive and experimental bands of the past half-dozen years," says the press release. 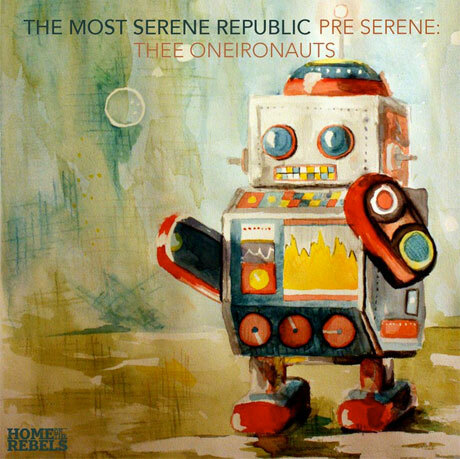 If you want to hear the genesis of the Most Serene Republic, be sure to listen to Pre-Serene: Thee Oneironauts here on Exclaim.ca between now and May 23.